Everyone we talk to, when it comes ponds, asks about aeration for their pond and most of them speak of it as if it were some complicated process or expensive undertaking. It's not complicated and it doesn't have to be expensive. Of course there are turn-key packages on the market that have all the bells and whistles and added parephenalia that makes it nice to look at and like many beautiful objects they can be pricey. You should put your money in more important things when basically the aeration system should be a reliable and clean source of circulation and oxygenation...nothing more...most of the time we try to hide the darned thing anyway so why spend a fortune! Now call me slow but that has got to be the simplest recipe, short of scrambled eggs, that I've ever seen. I mean how in the world can such a basic formula cause so much consternation and lead to so many different opinions and advice to be given? If you know all there is to know about air pumps and air compressors and blowers then you probably know what you need for your pond as far as pounds per square inch and cubic feet per minute of airflow and whether adual piston or rotary vane or linear air pump will be needed to make your pond happy! If you understand the different airlines, airhoses and other feeder tubing from self-sinking to rehular black poly pipe then you probably know the sizeand shape you need to use to fit your air pump! And...you know where I'm going...if you know the most efficient bubbler, airstone disc diffuser then you probably have an idea on what diffuser would work with your air pump! So if you are somelike that then you probably have it all figured out and maybe then you just need some various parts. If you already have a handle on what you need to build your own aerator then you can find what you need in our parts department. For everyone else we have built some all inclusive systems that offer everything you need to aerate your water garden, pond or lake without needing to be a bathometric limnologist with a degree in biological rocket scientology! There are many pond supply stores that sell parts or pre-built all-inclusive systems and you've probably heard of many of these or looked for reviews on forums and bulletin boards for recommendations. 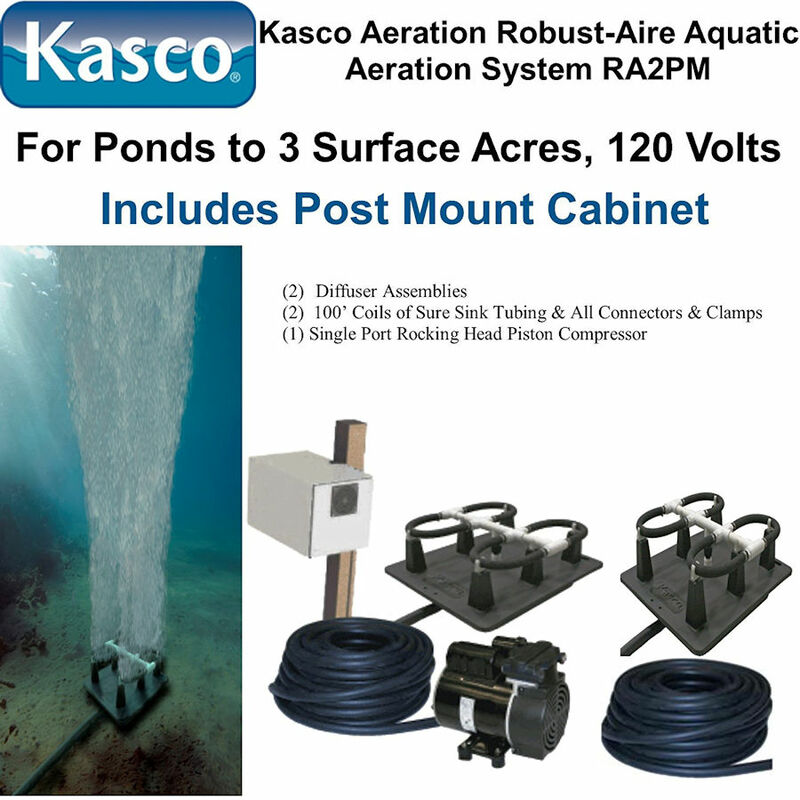 Vertex® Aeration Systems, AquaMaster® AquaAir, airBOOST® Deep Water Aeration Systems, AirTech Systems, Dr. Foster & Smith Koi Kits, Air-2-Go to mention just a few of the diffuder type packages that exist. All of them will work and some will work better than others. What makes one system more-efficient and more long lasting? Well...how the air pump is housed, the parts that are used, the ventilation design, the interioir mechanics of the electrical and magnetic and piston systems or rocking dual-piston etc..
Aerating a small pond correctly requires that the volume and depth are understood...especially the depth. These aeration systems are only good for ponds where the depth of the diffuser is not greater than 8 feet or 10 feet for the larger system. These aerators use powerful, silent, linear compressors that have a two-year warranty which is twice the industry standard. You will be pumping only air into your pond so there is no electricity cords in the water and because you are using air to blow bubbles into the pond you can use as little as 50 watts to aerate a pond more effectively than with a 1/2 HP 1800 watt fountain! These systems use Underwriters Laboratory Listed (UL), all-weather linear compressors that send air through the included weighted airline to the diffuser assembly or assemblies which are all included. All couplings, connectors, valves and instructions are include d so you won't have to make a trip to the plumbing supply store to by a missing fitting! You only need to place the 4-stone diffuser into your pond, the weighted airhose sinks and is a dark blue so practically invisible in ponds, connect the airline to the compressor outlet and plug it into to a standard 110/115V plug. While the compressors are designed for 4 seasons you will prolong the life of the compressor by housing it in a small box or decorative cover near the pond. If you are a do-it-yourself aeration system type of person then you likely only want to buy diffusers, tubing or pumps. If you are like most of us who want a complete turn-key aeration system that is cheap and easy to install without having to go to the hardware store for plumbing bits or have Uncle Jimmy build a wooden compressor shack then we recommend these fully complete systems. The pond size these simple systems can aerate depends mainly on the depth and shape of your pond, if you are unsure if these systems will be adequate for your pond then send us an email before you buy. These pond aeration systems are complete and ready-to-go packages including everything you need: lockable heavy-duty aluminum cabinet, efficient rocking piston air compressor, base mounted quad-diffuser airstone synergistic diffuser assembly, 6 foot power cord, GFCI receptacle, 3/8" weighted tubing which is self sinking so the installation of your diffusers from the boat is easier because everything sinks out-of-sight and in to place! To keep from bringing the electricity to the lake, the compressor can be located up to 1,000' away with the addition of our high PSI 5/8" poly black plastic tubing airline which connects to the compressor outlet. The included noise-reducing, fan-ventilated, weatherproof, heavy-duty steel cabinet can be installed easily on a post, pier or boat house. Instructions are included, and the entire unit can be shipped Ground. 115V/60 Hz. The depth of the pond where the diffusers are located will determine the type of compressor you require. Shallow ponds less than 9 feet deep can often be aerated with a small linear or diaphragm type of pump that are usually fairly silent and real energy misers. If you have a deeper pond, from 8 to 15 feet deep you may need to use a rotary vane compressor, although the carbon vanes are known to require changing every 18 to 34 months. Piston compressors can delivery up to 35 PSI or more and are excellent for deep water aeration. While piston compressors often do not have the high levels of CFM (cubic feet per minute) of airflow as a rotary vane or linear pump, they make up for it in reliable strong airflow. Whichever compressor you choose you will then need to run an airline to your diffuser system (airstone, membrane disc, diffuser tubing) and there are ways to save money here. Using weighted tubing or self-sinking airhose is the fastest way because it will sink quickly on it's own but it can run over $1.50 per foot or more. A cheaper way is to use standard airline, often 1/2" or even 3/8" which does float but by zip tying some rebar or threading the tubing through bricks you can run any length from the compressor to the diffuser for under $100. In order to determine the size of the compressor and the number of diffusers you will need there are at least two critical factors to consider and this is why it is often good to consult a pond expert before starting. First you must know the true depth of your pond as this will determine the PSI required from your compressor and when you look at the shape of the pond this determines the number of diffusers you need which will determine the best CFM you need from your compressor since most diffusers require at least .5 CFM for operation. A round pond like a big bowl with a single deepest area and an equally proportional interior grade may require only one diffuser placed at the deepest point. 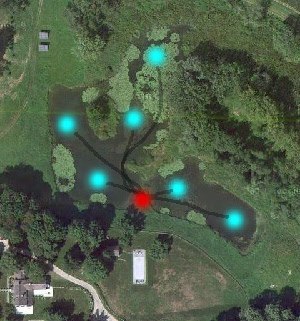 This will provide a nice even circulation but the diffuser doesn't necessarily have to be in the center so look at the entire pond as a whole because raising fish can add additional points of concern when using aeration such as overheating the pond with aeration. There are thermostat controls to automatically tun on aerators when temperatures drop below a certain level, this helps prevent fish kills as trout are very susceptible to warm temperatures. An irregular shaped, often kidney shaped or bean shaped, pond with more variations in depth and shoreline slope may involve the installation of one or more diffusers but again, this is not always the case. Balance the need for aeration by looking at the existing condition of the pond, do you have algae, are fish dying? Sometimes even in a large pond we only add a single aeration station...it all depends and there are no hard a fast rules to go by...although pond stores will try and often sell their biggest aeration package they can! When comparing aeration systems it is a good idea to look for forums and reviews that discuss the pros and cons of various systems. Since the principals of aeration are scientific and many companies offer products that do basically the same thing to various degrees of efficiency then it is up to us as consumers to use our due-diligence before buying a pond aerator. To compare prices with our recommended systems we have grouped some of the more popular bottom-diffuser aerator brands together for comparision with our best aerator systems.